OXFORD, Miss. – Three years ago, Seth Dickinson was just another University of Mississippi freshman enjoying time off for spring break. That is, until an unexpected hemorrhagic stroke left him comatose on his bedroom floor. When Dickinson awoke from his coma nine days later, the Mantachie native was paralyzed and mute. Gone were his ability to read, write, speak and walk. Worst of all was being told that he would no longer be able to pursue his education at the university. Fortunately, Dickinson’s story has a happy ending. Through his own determination and with strong encouragement from a supportive university staff member, he recovered, returned to school and will be walking across the platform Saturday (May 12) in The Pavilion at Ole Miss to receive his degree in public policy leadership. “I knew I was going to get back,” said Dickinson, who also will deliver the address at the Sally McDonnell Barksdale Honors College commissioning ceremony at 4 p.m. Friday (May 11) in the Gertrude C. Ford Center for the Performing Arts. After Dickinson was nominated by his peers, all four Honors College deans agreed he is the best person to deliver the address. “I’m differently abled in a way that I am recovering still, but for the rest of my life I will never take the moniker of ‘disabled,'” Dickinson said. Dickinson is the first person in his immediate family to attend and graduate from a four-year college or university. His decision to attend the university was a direct result of his initial meeting with Ryan Upshaw, assistant dean of student services in the School of Engineering. As a high school senior, Dickinson participated in a Lott Leadership Institute summer program, and Upshaw traveled to Washington, D.C., with the group. 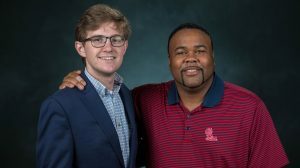 “I knew he was the type of student we needed here at the university,” said Upshaw, one of two staff recipients of this year’s Thomas A. Frist Award, which recognizes faculty and staff members for outstanding service to Ole Miss students. The transition from small high school to university life was difficult, Dickinson said. Within minutes, Upshaw responded with a phone call that resulted in what seemed to be Dickinson’s clear path to student success. Dickinson said Upshaw was his “ray of sunlight and hope” after the storm of his affliction. Upshaw had been to the hospital numerous times, had painted signs for Dickinson with his friends and family, and consoled his distraught mother as she regretfully had to have her son de-enrolled. Upshaw continued to visit Dickinson in the hospital numerous times, bringing him well-wishes and reminders that his home was in Oxford. Upshaw’s words lit a fire within Dickinson. He entered physical therapy and gradually fought his way back to mobility. Before the stroke, he did not consider himself a champion of disability rights. Upshaw said Dickinson is an inspiration to him and to many others. “He set a goal of returning to this university after his stroke, and he came back stronger than ever,” Upshaw said. “He distinguished himself as a student leader through involvement in ASB, the Honors College, the McLean Institute and other groups. Dickinson is the youngest son of Itawamba County Sheriff Chris Dickinson and Teresa Dickinson of Mantachie. His older brother is Chris Dickinson Jr., also of Mantachie.